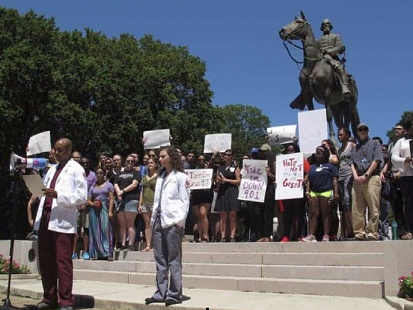 Story of Statues, Lies, and Listening"
You want to talk about statues? Let's talk about statues. 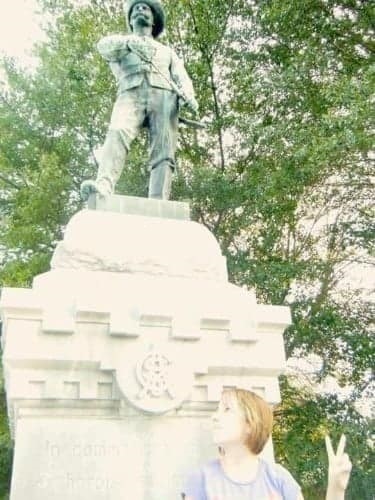 This photo is of me at age fourteen posing in front of a Confederate memorial in my own neighborhood where I grew up. I am a proud Southern woman. I drink sweet tea like nobody's business, know the difference between a Western and English saddle, and can make a pecan pie from scratch. Believe me when I say I love my heritage and my culture. I grew up one block down from the Chickamauga battlefield in Georgia. I had picnics in that park, went hiking on those trails with my girl scout troop. Confederate statues are all too familiar to me. In fourth grade I took a field trip to Stone Mountain to see the faces of Jefferson Davis, Robert E Lee and Stonewall Jackson up close and personal. This is a very fond memory for me of my childhood. I remember salt water taffy and blown glass figurines in the park. I remember riding the Summit Skyride and just looking out for miles and miles. "These men carved into this mountain are the men that lost the Civil War. These are the men who fought to be a separate America and lost. These are the men that fought to keep slaves." No one took the time to educate me on the real history of these men. Instead, I was filled with fun, happy thoughts. How could these guys be bad people? I mean, they're riding horses, come on! Every ten year old thinks someone riding a horse is cool. Now, there's a chance I just wasn't listening, or I didn't read enough wall plaques because I was an easily distracted kid who didn't care too much for history. But I guaran-damn-tee no one ever said the word slavery to me while I was there. Not my parents, not my teachers, not the park employees. The same goes for the Chickamauga Battlefield, less than half a mile from my front door. No one ever stopped to say, "this is important history because they fought to keep slaves and lost." 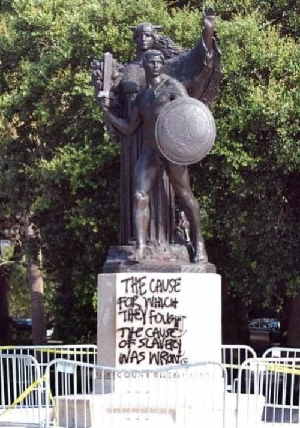 All that time I spent staring at sculptures of these men, I never knew they were fighting on the wrong side of history. Now you bet I heard phrases like "state rights" and "war of northern aggression". But it was always in passing and vague. What state rights? Aggression about what? No one ever told me, and I didn't know I was supposed to ask because it was all so normal to me. That's the thing about these memorials. Do they offend me? No, not particularly. Because they've been NORMALIZED my whole life. This is where it is our job to listen to marginalized people that are offended and hurt by these. If they say these are bad and we should take them down, they're probably right! Just because we've been taught our whole lives that they're okay, does not make them okay. The fact that they don't make me uncomfortable IS THE WHOLE PROBLEM. These statues aren't there to teach us history. They're there to rewrite history and feed us false perceptions of the Civil War. They make us comfortable with a very bad cause. Do you think these white supremacists were radicalized overnight? They are a direct product of DECADES of misinformation and misdirection. Of normalization and an overwhelming acceptance of "how it's always been". The South can no longer fall behind the ideology of how it's always been. Times are changing, and we should too. I love being a Southerner. I love my heritage. But I can be proud of where I come from without embracing a history that never really was. I can acknowledge my ancestors' mistakes and appreciate the past without glorifying them on pedestals. We don't need a single Confederate statue. Not until they're all accompanied with real teachings and historical lessons, which can happen in a museum. 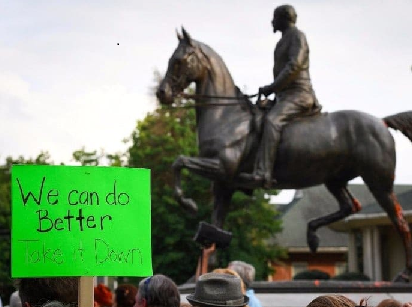 Not until we have our picnics beside Robert E Lee and describe him to our children as he REALLY was. Please share this so all centrists and sympathizers can know that yes, you can be a proud Southerner and NOT defend these terrible things. It's not our fault that we've been misled our whole lives. But we're adults now, and we no longer have an excuse for not educating ourselves. I am a proud citizen of the United States of America, not the Confederate States of America. Guest blogger Rose Sampley, 22, was born and raised in Fort Oglethorpe, Georgia before attending upper school in Chattanooga, Tennessee. She currently resides in Knoxville, Tennessee where she is employed by a local non-profit organization. As with all of our guest bloggers, the opinions expressed are personal, not necessarily shared by all on the Women for Justice Team. We are committed to offering a platform for women to responsibly raise their voices and be heard. Women for Justice is an all-volunteer team of activists. The best way to support our work?